The scenic byway starts at the intersection of M-65 and Rollways Road and runs eastward along M-65 near Loud Dam Pond. The road runs through the Huron National Forest and along the Five Channels Dam Pond to a junction with River Road. There, the byway leaves M-65 to follow River Road eastward along the south bank of the Au Sable River. 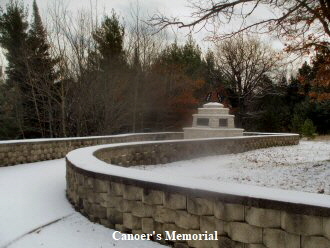 The road passes the Canoer's Memorial, the Kiwanis Monument and the Lumberman's Monument near Cooke Dam Pond. River Road runs away from the river, cutting across forest land near a bend in the Au Sable. Near the Old Orchard Park, the byway follows the southern shore of Foote Dam Pond. From here east, the roadway continues along the south bank of the river, across from Oscoda-Wurtsmith Airport, as it runs into Oscoda. The eastern terminus of the byway is at a junction with US 23 in town, a few blocks from Lake Huron. The segment of the byway that follows M-65 is maintained by the Michigan Department of Transportation), while River Road is under the jurisdiction of the Iosco County Road Commission). South Branch Trail Campground Group Site is ideal for equestrian camping. The group area impresses with its beautiful scenery and convenient access to horseback riding and hiking along the 240-mile Michigan Shore-to-Shore Horseback Riding and Hiking Trail. Priority will be given to campers with horses, however everyone is welcome. The spacious site holds up to 250 campers and features a day-use horse parking area. Rollways Campground is located 7 miles from Hale, Michigan along the beautiful AuSable River. The site was built in 1909 as one of the first campgrounds established in Huron National Forest. The space is small and secluded and features an observation area, picnic grounds and log shelter..The facility is located just off the River Road National Scenic Byway in northeast Lower Michigan. The byway showcases incredible views of the AuSable River Valley. Natural Features: Rollways is perched on a high bluff overlooking Loud Dam Pond on the AuSable River. The river flows from west to east for 138 miles until it reaches the great Lake Huron. Recreation: Hike on the accessible trail that connects the campground and picnic area to Westgate Scenic Overlook. Bring binoculars and a camera to take advantage of the epic view. The same hiking path passes a stairway leading down to the river where visitors can fish and wade. Loud Dam is capable of producing 4,000 kilowatts, the hydro was completed in 1913. 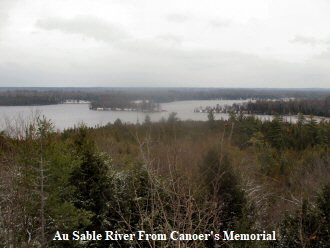 It is named for Edward Loud, who had done extensive lumber business along the Au Sable and bought up most of the cut over Au Sable lands between 1900-06, then later partnered with company founder William Foote and others to build the Au Sable hydros. Five Channels Dam is a hydro-electric dam on the Au Sable River in Michigan. Consumers Power Company (now Consumers Energy) began construction on this hydro-electric dam in 1911 and completed it in 1912. 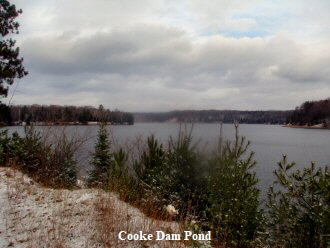 The dam, the second of six built by the company on the Au Sable River, is named for the nearby location where there were once five distinct river channels. The current plant is capable of producing 6,000 kilowatts. During construction of the dam, the company tried to provide a healthy environment for workers by incorporating lessons learned on worker safety and health during construction of Panama Canal. They built a 45 acre camp for workers and their families, complete with a central water supply and sewage system, icehouse, school, washroom, store and boardinghouse. The workers also received land on which to build a house; the resulting structures ranged clapboard houses to log cabins to tarpaper shacks to tents. At the completion of dam construction, the worker's camp buildings were moved to the next construction site (the Loud Dam) or razed. The site of the workers' camp built to support construction of the dam was listed as an archaeological site (designated designated on the National Register of Historic Places on March 13, 2002. 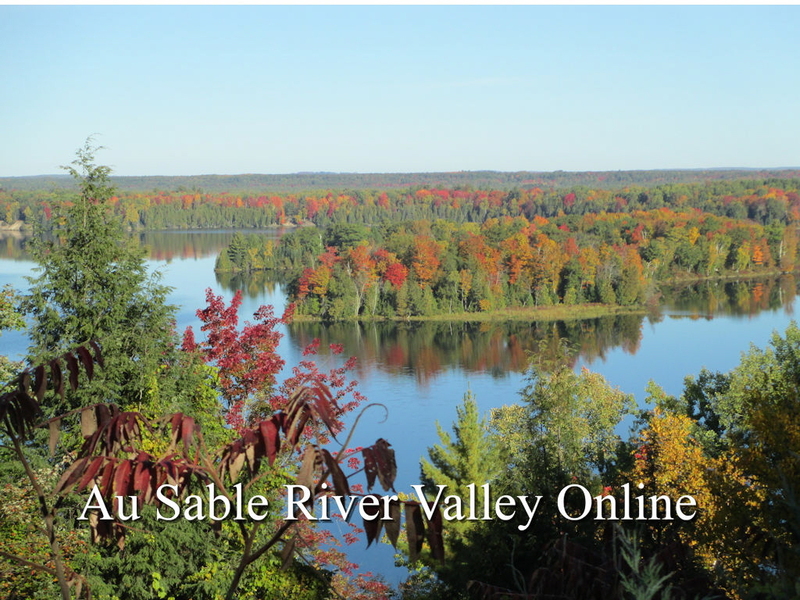 Lying off of River Road National Scenic Byway, Iargo Springs provides a panoramic view of the Au Sable River. 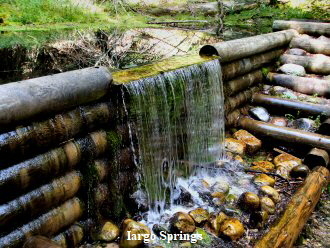 Used as a drinking water source since pre-settlement times, dams were constructed on the springs by early loggers before the turn of the century. The dams were useful in diverting water to the logging camps nearby. Most of Cooke Pond was dry land then. Europeans have visited the springs for recreation since the 1920s. 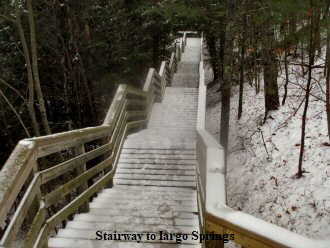 A trail to the springs was constructed by the Civilian Conservation Corps in 1934. Early photographs show the dam being repaired and reinforced by the CCC's. The dams lasted until 1981 when a storm took them out. The site was renovated in 1991. Steps were added and boardwalks along the springs, as well as the dams being rebuilt. Canoer's Memorial honors those that have paddled and those that continue to paddle these flowing waters. Access to Highbanks Trail during summer months is available at this site. 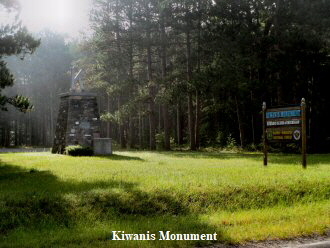 Kiwanis Monument commemorates the efforts of private citizens in the reforesting of Michigan's barren lands. Corsair Trail has 28.3 miles of one-way trail that varies from gently rolling, easy terrain to somewhat hilly, most difficult terrain. The trails may be hiked anytime during the snow-free periods. The trails are marked with blue diamond-shaped confidence markers. From Corsair Trailhead - This portion of the trail has a spur to a 600 ft. interpretive and fishing trail along Silver Creek.. From Silver Valley Trailhead - The portion of trail from this trailhead offers skiing that is gentler and less hilly. There are two Silver Creek bridge crossings on this section. Wrights Lake Trailhead - This portion of the trail provides a little more challenge with longer loops and steeper hills. Cooke Dam is a hydro-electric dam on the Au Sable River in Michigan. 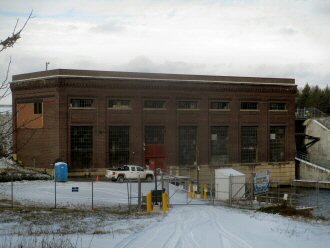 It was listed on the National Register of Historic Places in 1996 as the Cooke Hydroelectric Plant. 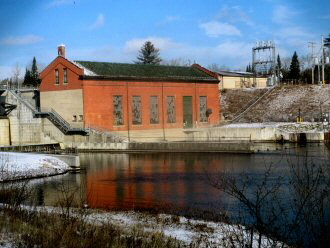 This dam began generating electricity in December 1911, with an original capacity of 9,000 kilowatts, making it the first of the six Au Sable River hydros. Cooke is named for banker Andrew Cooke, who helped secure financing for the project. 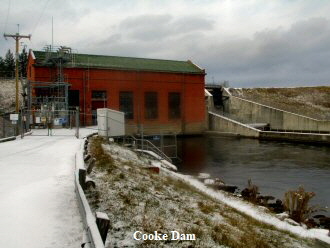 Cooke Hydro was listed in the National Register of Historic Places on Aug. 2, 1996. The honor recognizes the hydro's transmission of 140,000 volts, 125 miles to Flint, establishing a world record. Innovations included three-legged, windmill-like towers that supported the transmission line and advances in insulator design. Cooke Hydro is also part of the River Road Scenic Byway and listed in the National Scenic Byways Program. 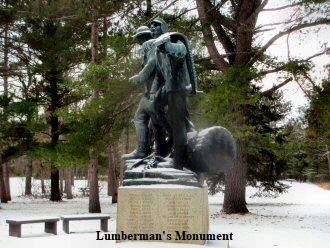 Lumberman’s Monument, a 14-foot bronze statue dedicated to Michigan lumbermen, is the centerpiece of a major Forest service visitor Center located on the Cooke Hydro pond. The site features interpretive displays, along with a panoramic overlook and staircase leading down to the pond. 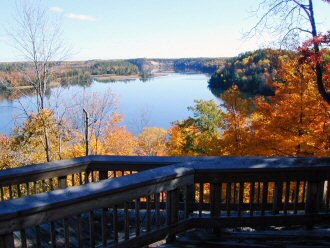 This overlook provides visitors with views of the Au Sable River and Foote Pond, created by the Foote Pond Dam. Habitat for eagles is visible from this vantage point, and visitors may have an opportunity to view eagles or other wildlife. This is also a spectacular location to view fall colors. 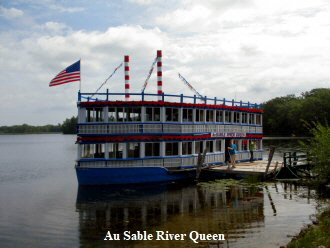 The AuSable River Queen is the only paddlewheel riverboat of its kind and offers a variety of tours. This unique paddlewheel boat runs into the fall so that you may take in the splendor of the autumn colors. Live music is provided on the AuSable River Queen on weekends and there is a snack bar as well. Two hour round trip on the beautiful AuSable River. Open Memorial Day until mid-October. Foote Dam is a hydro-electric dam on the Au Sable River in Michigan. This hydro-electric dam was completed in 1918 and generates a current of 9,000 kilowatts. It is located 9 miles upstream from Lake Huron and is named for William A. Foote, the founder of Consumers Power, which later became Consumers Energy. 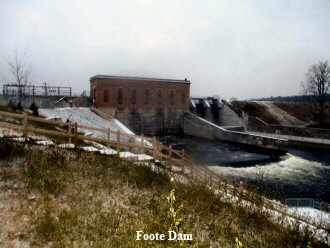 In 1896, Foote took a side trip from Kalamazoo to Allegan, where he conceived the idea of a hydroelectric plant along the Kalamazoo River. In Foote's mind, that plant and others would power the industrial centers throughout the state. There is a short, half hour walk on a limestone path to the Rollways Day Use area. Westgate features a kiosk that provides information on the Au Sable River and River Road National Scenic Byway. This is a great location to view the river and see fall color. Wildlife abounds and visitors will have many opportunities to see the varied bird life of the area, particularly trumpeter swans and eagles. 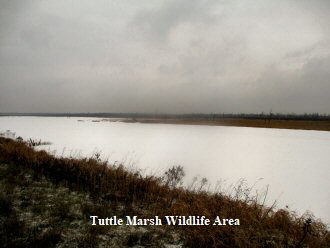 Tuttle Marsh is a 5,000 acre wetland project consisting of over 3-1/2 miles of level ditch network and a 2-1/2 mile low-head dam with water level control structures. 35 earthen nesting islands have been constructed. Site includes a 380 acre impoundment area, open water and marsh and wildlife viewing areas. Deer, fox, coyote, muskrat, beaver, otter, weasel and a large variety of bird species. One of many fishing accesses along the river, this site has an accessible fishing ramp. 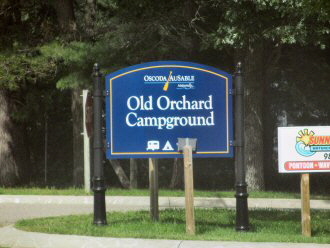 Oscoda Beach Park is located on River Road on Lake Huron in Oscoda. This 9.6-acre park has approximately 1,000 feet of Lake Huron frontage and a variety of amenities. In addition to the public beach visitors may enjoy the basketball court, skate ramps, a wooden band shelter, shuffleboard court, an accessible pavilion, boardwalk, sunbathing deck, children’s play equipment, picnic tables and grills. 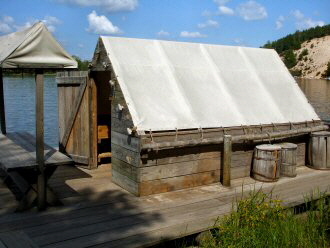 The site has an accessible bath house with showers and restrooms. This park is home to the “Dock Reserve,” the historic site of a dock predating the Fire of 1911. 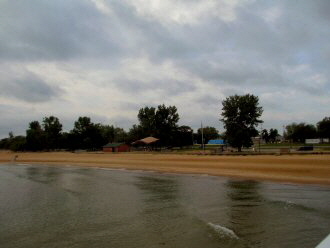 This Park also hosts the Oscoda Art-on-the-Beach Arts and Crafts Show every summer.